Been there. Done that. Madison Bumgarner will take the hill for the San Francisco Giants in the National League Wild Card game and it’s hard to bet against the big lefty. Bumgarner is one of a handful of Giants looking for his third World Series ring. As a rookie he helped San Francisco win it all in 2010 and he was a vital cog in the 2012 title team as well. The Giants face a tough Pittsburgh Pirates squad tonight in the Steel City, but Bumgarner should give his side plenty of confidence. Despite being just 25 years old, Bumgarner is an experienced postseason veteran. He has shined in the biggest of moments. 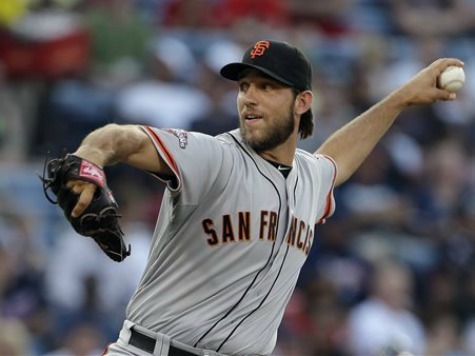 As a rookie Bumgarner threw eight shutout innings in Game 4 of the 2010 World Series. He followed up that gem by hurling seven scoreless innings and fanning eight in Game 2 of the 2012 Fall Classic. He started his World Series career with 15 scoreless frames, rivaling the numbers of the legendary Christy Mathewson. He’s not intimidated by crowds or adversity. PNC Park will likely be raucous for the Wild Card battle, but “MadBum” thrives in those conditions. This season has been Bumgarner’s best and it came at the perfect time. With injuries and other obstacles in their way, San Francisco needed a jolt. Bumgarner obliged, setting career-high marks in wins and strikeouts. His ERA was just under 3.00 overall and closer to 2.00 away from Frisco. He truly plays as a road warrior. Bumgarner posted an impressive 11-4 mark away from home this year but his only start against the Bucs was less than stellar. In late July, Pittsburgh touched him up for five earned runs on six hits in just four innings of work. That was then. Now it’s win or go home. Bumgarner and the Giants have been amazing in these spots. Just two years ago, Bruce Bochy’s boys overcame six elimination games on the way to a world championship. Many of the men who pulled off those clutch victories remain. Along with Bumgarner, Tim Lincecum, Hunter Pence, and Pablo Sandoval all played crucial roles on that never-say-die ball club. They will all be needed if the Giants are to make another deep run this time around. The Pirates have a real home field advantage in this match-up because their crowd has already shown what kind of energy they can bring. Last year the ballpark rocked as the Pittsburgh backers celebrated a return to the playoffs after a lengthy absence. They should be just as feisty tonight. The National League, of course, does not use the designated hitter. However, the Giants for all intents and purposes will have what amounts to a DH this evening. That’s because Bumgarner doesn’t just deal, he can flat out rake. A sure bet to win the Silver Slugger, he hit .258 with four home runs and 15 RBIs this year. The streaking Pirates and Edinson Volquez, tonight’s starting pitcher, have been red hot. Since late June, Volquez enjoys a 9-1 record with a minuscule ERA of 1.85. His teammates have been right there with him. Clint Hurdle led the Bucs to a lusty 17-6 mark in September. The streak has included lots of long balls. Pittsburgh blasted at least one homer in their last seven games. They hope to continue that success at the plate against the seasoned G-Men. While many key Giants like Marco Scutaro, Angel Pagan, and Matt Cain are still on the shelf, one of the walking wounded could be a difference maker. Brandon Belt has been on the DL three times in 2014 but he hit well in the season’s last week. Along with Buster Posey, Belt will look to provide the pop the Giants will need to erase the scrappy Pirates. Beating Pittsburgh will be no easy task. A crazed crowd will be on hand to support a team that tied for the best home record in the NL. The reigning MVP Andrew McCutchen is ready to roll. The Pirates expect to win this game. Bumgarner and crew have other ideas. One thing’s for sure. If the Pirates don’t slay the Giants tonight, the Cardinals, Nationals, and Dodgers best beware. San Francisco knows how to win when they need to most. If the Giants survive the Wild Card round, we could very well be in for another Orange October.